1x Duronic DM252 Desk-Mounting Kit. An HP 400 Six-Core i7 now with a FREE second 24″ Display. 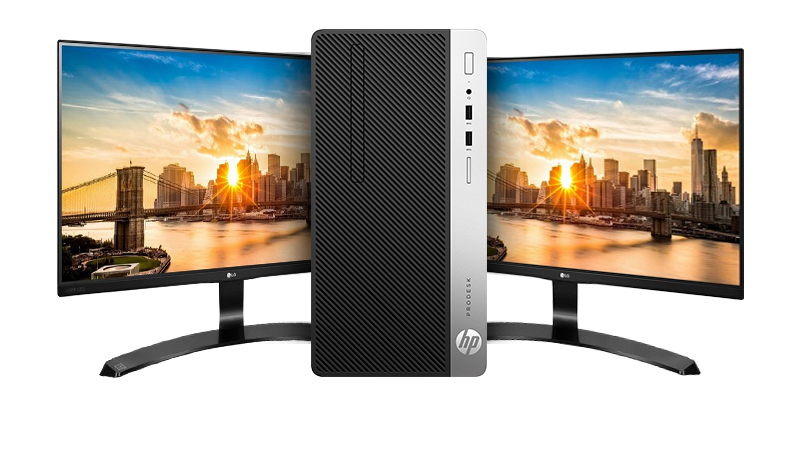 The HP ProDesk 400 G5 features an 8th Gen i7 CPU & 1TB HDD. Max it out with up to 32GB RAM and NVIDIA graphics options. Great performance PC to lease capable of entry graphics performance such as AutoCAD LT or Adobe Creative Cloud. Need more than 2 displays? 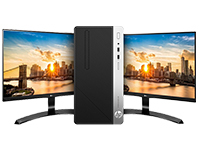 Double down on displays & check out our HP 400 i7 Quad-Display Bundle! The bundle racks up a rather impressive discount of over 20%. Utilising the dual display functionality of the HP 400, this bundle comes with 2x LG 24” 24M38H HDMI displays and a desktop mounting solution to ensure you get the best day to day user experience possible. Leasing is great for cash flow and comes free with HardSoft’s all-inclusive three years service and warranty, offering you premium service and hardware performance at entry level costs.